Sixty-eight years ago today Japan surrendered, marking the end of World War II and the cessation of hostilities in Asia. But the animosity engendered by that conflict and Japan’s colonial rule in Korea and incursions in China that preceded the war lingers on. Among Japan’s neighbors in the Asia-Pacific, there is a widespread sense, especially in northeast Asia, that Tokyo has yet to atone for its activities more than two generations ago. Neither the Chinese nor the Koreans believe Japan has sufficiently apologized for its military actions during the 1930s and 1940s. But the bitter legacy of that period appears to weigh more heavily on people in Northeast Asia than in Southeast Asia, according to a survey conducted this spring. While the Philippines, Indonesia and Malaysia were also occupied by Japan during World War II, the memory in those countries appears less powerful. A quarter of Indonesians and nearly four-in-ten Malaysians express no opinion about the need for a Japanese apology for its previous actions. And those who do have a view are generally divided over whether Japan needs to seek more forgiveness or whether the time has passed for such apologies. Such is the case in the Philippines, where 47% say Japan needs to apologize more, whereas 48% say no request for forgiveness is necessary or that Japan has sufficiently apologized. Those sentiments stand in stark contrast to those held by many Japanese. 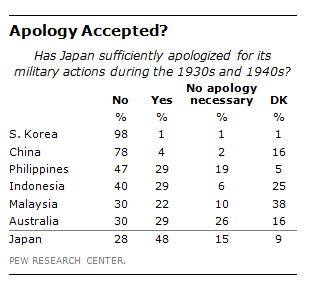 Nearly half (48%) of Japanese think Tokyo has sufficiently apologized for its military actions in the 1930s and 1940s. Another 15% think no apology is needed. Taken together, this means a strong majority of Japanese (63%) think the past is behind them. Such views are even more prevalent among young Japanese: 73% of those aged 18 to 29 think Japan has already asked enough for forgiveness or need not apologize at all. The contrast with the views of other young Asians is quite striking. They think Japan still has much to answer for: just 3% of young Koreans, 4% of young Chinese, 31% of young Indonesians and 36% of young Malaysians are willing to drop the issue of Japanese war guilt.